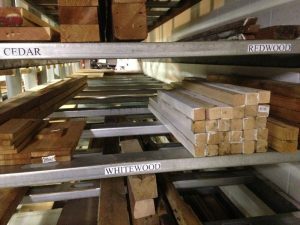 How cheap can a project get? Let’s look at the mobile grinding station featured in this month’s 1st tip. It starts with a free Craftsman tool stand from a Sears dumpster. Then, use some 2x2s salvaged from a friend’s trash down the street. All of these 2x2s were already cut and painted, sitting by the side of the road for someone to pick up and give them a home. I was happy to oblige. To boot, I got them on my predawn walk; no pride was sacrificed in the making of this project. 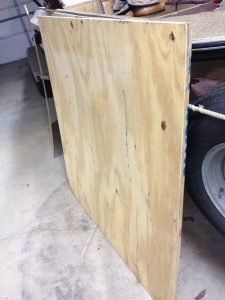 Add a scrap piece of plywood for the top. Some of my best finds occur in the dark. I toted this back home one morning, adding calorie burn to my walk and a beautiful half-sheet of CDX plywood to my collection. A half-price grinder, a full-price mobile base, a few bolts and the rest was free. Not a bad deal for a mobile grinding station. 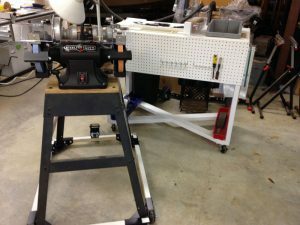 Tips from Sticks in the Mud – February 2017 – Tip #1 – Benefits of a Mobile Grinding Station February Poll: How Do You Sell Tools You No Longer Use/Need?